Girls of Truth, a unique set of Bible story-based heroine dolls created by an award-winning educator and a celebrated graphic designer, are now available for holiday gift-giving at a special price of $75 per doll. Elementary school teacher Stephanie Ward, an avid doll collector for most of her life, long felt there was an opportunity to share stories of faith and strength of character to young girls in a creative, simple-to-understand way by appealing to their love of play and dolls. With that inspiration, she partnered with graphic designer Caryn Dahm and seamstress Elizabeth Wynn to bring to life her vision of Esther, beloved queen and heroine of the Old Testament, and Mary, mother of Jesus. Esther and Mary are the first two in the Girls of Truth doll series. The dolls are robed in richly-colored, hand-sewn garments that represent the clothing of their time, and have soft life-like features and hair that young girls can style and comb. Each Girls of Truth doll comes boxed with a tiny storybook enclosed. Simply written and beautifully illustrated, the storybook tells the story of the biblical character in a colorful, compelling narrative that describes her life and experiences, and then poses some questions to help young readers write their own stories of faith. 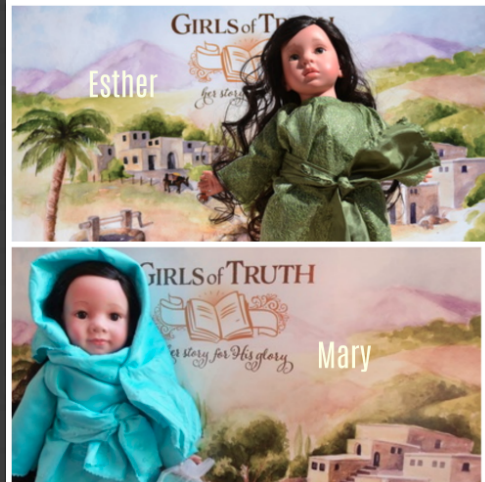 Esther and Mary are available for $75 each at Girls of Truth Dolls.